Enhancing Fisheries Science and Education in the Northeastern U.S. 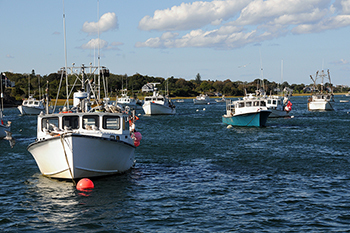 The NOAA Northeast Fisheries Science Center (NEFSC), the Woods Hole Oceanographic Institution (WHOI), and the University of Massachusetts School for Marine Science and Technology (SMAST) are working together to train future generations of scientists in a program designed to address an anticipated shortfall of researchers in the fields of quantitative fisheries and ecosystem science. Under a National Oceanic and Atmospheric Administration program called Quantitative Ecology and Socioeconomics Training (QUEST), the new partnership will focus on teaching and advising in a graduate fisheries program and developing new technologies to improve assessment and management capabilities. "Dwindling fish stocks and associated economic impacts spell a significant need for trained personnel and new technologies in fisheries science," said Richard Merrick, director of scientific programs and chief science advisor for NOAA's National Marine Fisheries Service (NMFS), the NOAA agency that initiated QUEST. "This new partnership in Quantitative Fisheries and Ecosystem Science is a tangible step toward enhancing the scientific basis of assessment and management of resources and to educate future personnel in quantitative aspects of fisheries science." As part of this collaborative effort, three new fellowships for WHOI scientists and a new faculty position at SMAST were created with NMFS funding through the Cooperative Institute for the North Atlantic (CINAR), a nonfederal research consortium located at WHOI. These new positions will collaborate to train graduate students in cutting-edge methods, technologies, and research approaches. "I am grateful that CINAR can establish this important program with NOAA," said Don Anderson, director of CINAR and a biologist at WHOI. "Fisheries are a major marine resource in the northeastern U.S., and a critical component of the regional economy. This long-term partnership will bring new technologies to bear on fisheries and ecosystem science, and will help to train the workforce needed for those assessment and management challenges." Stock assessment research, which combines statistics, economics, ecology and other disciplines, provides essential information for fisheries management. It is increasingly evident, however, that effective management of individual fish stocks requires an understanding of the ecosystems they function within—leading to a major new emphasis on ecosystem-based management (EBM) strategies. Due to an aging scientific workforce within NOAA and fewer students going into the necessary fields of study for fish stock assessment, there could be as many as 180 vacancies within NMFS over the next decade, according to a 2008 report issued by the Departments of Commerce and Education. “QUEST truly strengthens our regional capacity for research and education in fisheries and marine science,” said Bill Karp, science and research director at the NEFSC. 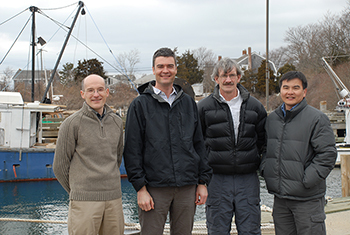 “I look forward to a productive and collaborative relationship with WHOI and SMAST.” Researchers at the NEFSC play a large role in monitoring and evaluating the condition of fishery resources off the Northeastern U.S. and developing stock status advice for fishery management. Three WHOI scientists have been named CINAR fellows through this partnership. They are: Rubao Ji, an associate scientist in the Biology Department; Porter Hoagland, a senior research specialist in the Marine Policy Center; and Gareth Lawson, an associate scientist in the Biology Department. Ji's work will concentrate on transferring numerical modeling tools and data products developed in his on-going research projects for fisheries stock assessment. Hoagland will work on incorporating social sciences into ecosystem-based fisheries management and will study the economic and welfare impacts of alternative fishery conservation and management strategies for U.S. Northeast shelf ecosystems. Lawson will work with colleagues at the NEFSC to focus on the development of acoustic techniques for sampling zooplankton (animals that are suspended or drift in the water) and micronekton (small but actively swimming organisms) for ecosystem assessment. In addition, CINAR fellows could potentially host SMAST students in their labs and participate in teaching classes. "We are incredibly excited about this new research and education partnership," said WHOI President and Director Susan Avery. "It holds great promise to provide teaching and advising activities, expand our understanding of the rapidly changing marine ecosystem, and advance the development and implementation of new technologies that could significantly improve and enhance fisheries assessment and management capabilities in the U.S. Northeast coastal region." As part of this partnership, Gavin Fay will join the faculty at SMAST in the Department of Fisheries Oceanography. Previously a postdoctoral research associate at the NOAA NEFSC’s Woods Hole Laboratory, Fay's research focuses on spatial modeling and statistical analyses of marine fisheries populations with an expertise in quantitative fisheries science and ecosystem modeling. "We are very pleased to welcome Dr. Fay to SMAST," said Steven E. Lohrenz, dean of SMAST. "He possesses a strong skill set that will further strengthen the solid foundation at SMAST in fisheries and ecosystem modeling. This new position will strengthen collaborations among SMAST, NOAA, and WHOI and create new opportunities to develop joint research and educational programs involving students, staff, and faculty." "Sound science is critical to the successful management of Massachusetts' fish stocks, and I'm pleased NOAA is supporting this new partnership between NEFSC, WHOI, and SMAST," said Senator Elizabeth Warren. "This effort will strengthen fisheries science education and research, and will help ensure that we have enough trained researchers on the job to support fisheries management in the Northeast." "In order to get the best science to manage and grow our fishery, we need to train and employ the best scientists," said Senator Edward J. Markey. "This program will put the best minds at work to help understand what is happening in our ocean so our fishermen and coastal communities can thrive for generations to come. ""I applaud the enhanced partnership between Woods Hole Oceanographic Institution, the University of Massachusetts Dartmouth’s School for Marine Science and Technology, and the NOAA's Northeast Fisheries Science Center," said Congressman William Keating, who represents the Mass. 9th District. "Both WHOI and SMAST are renowned for their commitment to empowering scientists and for their groundbreaking contributions that have had significant impacts on our daily lives. The creation of a new faculty position with a focus entirely on fisheries research allows our region to truly reap the benefits of strengthened collaboration and expertise. Further, this will help to provide critical—and timely—fisheries and stock assessment data to protect and preserve the vitality of this precious resource and fishing industry for generations to come." The Woods Hole Oceanographic Institution is a private, non-profit organization on Cape Cod, Mass., dedicated to marine research, engineering, and higher education. Established in 1930 on a recommendation from the National Academy of Sciences, its primary mission is to understand the ocean and its interaction with the Earth as a whole, and to communicate a basic understanding of the ocean's role in the changing global environment. NOAA’s National Marine Fisheries Service works to promote sustainable fisheries and to prevent lost economic potential associated with overfishing, declining species and degraded habitats while striving to balance competing public needs. The University of Massachusetts School for Marine Science and Technology (SMAST) offers advanced degree programs focused on interdisciplinary basic-to-applied marine sciences and the development of related innovative technologies. In addition to the scholarly marine science and technology communities, the SMAST mission also emphasizes interaction with regional industry, and government and non-governmental agencies on compelling regional marine-related issues and technological development.